Kyivsky cardboard paper mill (Obukhiv, Kyiv region), a leader in Ukraine’s pulp and paper industry in terms of production and sales, produced goods worth UAH 1.323 billion in the first quarter of 2018, which was 30.2% up year-over-year (y-o-y). Thus, production in the first three months of 2018 somewhat slowed compared to the same period last year (production growth in January was 36% and that in January-February was 34.3%), the UkrPapir association said. 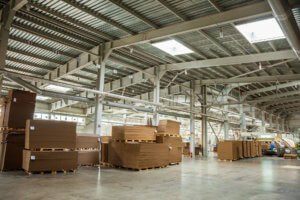 Corrugated packaging output grew by 18%, to 55.8 million square meters, which was the second highest result among producers of corrugated packaging in Ukraine after Rubizhne cardboard packaging mill in Luhansk region (with Trypilsky packaging plant). Production of cardboard increased by 35%, to 55,800 tonnes. Production of package cardboard alone grew by 45.7%, to 35,840 tonnes, while box cardboard output rose by 18.7%, to almost 19,000 tonnes. However, production of base paper (for sanitary products) stood at 18,380 tonnes, which was 1.7% down y-o-y. Toilet paper output grew by 8%, to 103.9 million rolls. Corrugated packaging output in total in Ukraine (including other producers) grew by 12% January through March 2018, to 246.56 million square meters, that of paper and cardboard increased by 16.4%, to 234,230 tonnes. Kyivsky cardboard paper mill is one of the largest cardboard and paper producers in Europe. It employs almost 2,200 people. It sells produce to almost 700 companies in Ukraine, some CIS member states and the rest of the world. In 2017, the mill saw a 14.8% rise in production from 2016, to UAH 4.850 billion.